Mucha portrays Summer as a sensual and sultry brunette with red poppies in her hair. A serene mood of repose and contentment pervades the scene as the woman leans against a grapevine with her feet bathing in the shallow water below. 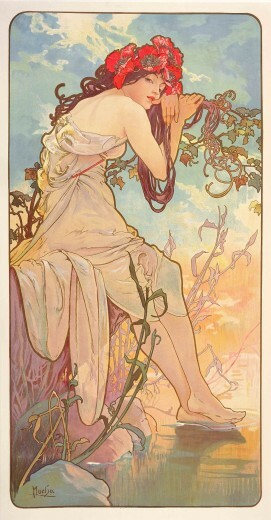 Mucha captures the summer light in the delicate blue sky beyond.